The simplest and fastest way is to use Google’s search interface. 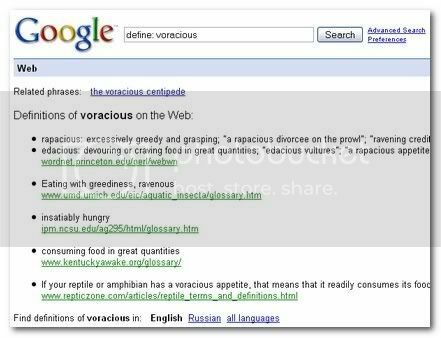 Just type ‘define: voracious’ (without the quotes) in the Google search box to get the meaning of the word ‘voracious’. It’s simple, fast and you can use the same familiar interface you use to search for other things. As geeky as the name sounds, this dictionary is fast like a ninja! Just try it to find out just how fast. Ever since I’ve found Ninjawords, that’s where I go first to get meanings for the words I am looking up. It has a Firefox extension to add Definr to list of search engines. Type definr/voracious in Firefox and hit Ctrl+Enter to get you the meaning for voracious. OneLook has a quick dictionary feature just like the others for quick lookup. But, it is more like a search engine for words and phrases. It has more than 5 million words from over 900 dictionaries indexed! As Jeanne explains in the comments, it is a great resource for anyone trying to build their vocabulary or just plain looking up word’s meaning or origin, etc. If you are a person who loves to learn new words, the Reverse dictionary feature can be fun to play with! I once had a Reader’s Digest Reverse Dictionary and had so much fun learning new words. What do you use for your dictionary needs? Do you find one of these useful enough to bookmark and use later? I was a fan of Google define operator, and had been using it regularly. But one day, I found out HyperWords FF extension, and all my definitions are just a right click away now. It can fetch meanings from many sources including Google, Wikipedia, etc. Nice tools, generally I use Google define operator. Nirmal.. thanks dude! It is really handy when you already have a google search page open or just use it from Firefox search bar. Those look better, but I don’t use them very often. One Look Dictionary Search (http://www.onelook.com/) is good, too. 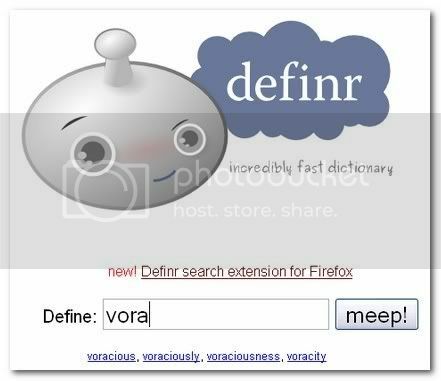 It gives you access to 986 different dictionaries, including specialized dictionaries–though it does give you a “quick definition,” as well (while also listing the major general dictionaries that define your word.) Another neat thing it offers is a reverse dictionary feature. Very interesting site! I know you’re looking for “quick” here, and One Look’s “quick definition” does fit that criterion. At the same time, if you should need them, you’ll also have access to the other references and features that are available at this site. Jeanne.. that is an excellent addition. I like the ‘quick’ definition and the availability of other resources ‘right there’ if needed! I love learning new words although I try to keep my language in my posts to simple English. I am going to update this post with OneLook! Good one…I regularly use Google define. There is a Dictionary Tooltip Firefox extension which i am currently using is also easy to use. Just by double clicking the word pops up a tooltip which brings the meaning, history usage and from various websites. Give it a Try…. I’ve just published a new online dictionary/thesaurus, memidex.com. It has extensive cross-referencing, complete inflections, simple interface, and frequent updates. It is informative.nnBTW I love the way you write and update your social pages with most of this advanced plugins (.i.e the plugin that helps us tweet your post at the bottom of each post). You’re to good about social networking.